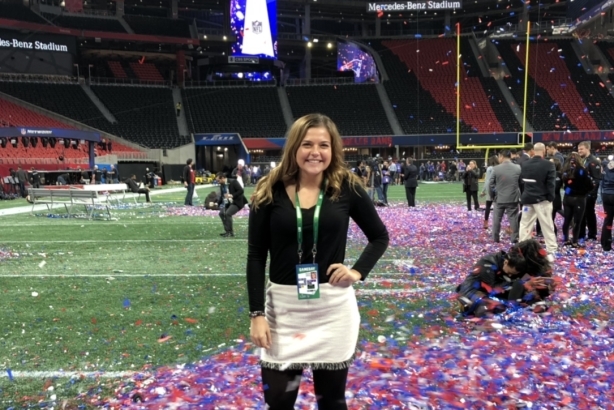 Student Rachel Tasker worked as an NFL PR assistant at the Super Bowl in Atlanta. Here are her lessons learned from the event. As a senior at Penn State University majoring in PR and striving to work in the sports industry post-graduation, being offered an opportunity to serve as an NFL PR assistant during Super Bowl LIII in Atlanta was a dream come true. I went into the role, ten days in advance of the biggest sporting event of the year, with little detail about what my day-to-day job responsibilities would entail. Some industries are more conducive to a fast-paced work environment than others, and PR is one of them. From the beginning, I knew this opportunity would force me to be flexible in my approach to assignments. One of my gameday tasks was serving as a PR representative for New England Patriot Jason McCourty for post-game media sessions. However, in a game like football where the deciding factor of victory can come down to the last 30 seconds, the athlete I was assigned to had variability. In the craziness of storming the field amid hundreds of reporters and family members and identifying a numberless player under his victory t-shirt through canons shooting confetti, flexibility and adapting to change on the fly was instrumental. Assignments delegated to staffers for the duration of the game were done throughout the week based on each of their professional skillsets and experiences. When an e-mail went out mid-week asking if anyone was bilingual, I was exceptionally thankful to have taken up a second focus of study in Spanish during college. Because of this skill, I was selected to assist ESPN Deportes’ sideline reporter, who was broadcasting the game in Spanish. While I used to think this skill might not be of extreme value in the realm of sports PR, it was beneficial to have it in my tool belt, and solidified my belief that honing skillsets outside of the field make all the difference when opportunity knocks. Overall, this experience showed me that it really is about who you know. The opportunity to work Super Bowl LIII did not just land in my lap – it was a goal I aspired to reach for years. And it didn’t present itself to me through making the right connection during the hiring process, but rather two-to-three steps back in the connection of a connection; a roommate of a friend; a colleague of an alumni mentor, for years in advance. I think one of the most important skills for success in any field, but especially PR, is having foresight in your career goals. If you know where you want to be in three years, even if it’s standing on the 30-yard sideline of the Super Bowl, think about who you can meet today that can help you get there. And in return, who can you connect with and help reach their goal? Rachel Tasker is a senior in the Donald P. Bellisario College of Communications at Penn State University.